Lucinda Geoghegan graduated in music from the University of Edinburgh in 1982, completed a postgraduate teaching qualification at Moray House College of Education and trained with the Kodály Institute of Britain where she gained an Advanced Diploma in musicianship with Distinction. 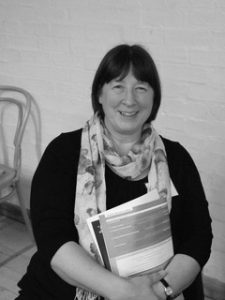 She worked as a secondary music teacher in Edinburgh before deciding to specialise in Primary and Early Years Music Education. She was also member of staff with the Royal Scottish National Orchestra Junior Chorus for 16 years and was Director of the NYCoS West Lothian Choir for 8 years. She is currently a theory and musicianship lecturer at the Royal Conservatoire of Scotland working in both the Senior and Junior departments and in addition since 2011 has been delivering and assessing RCS accredited modules in Kodály Philosophy to external students. She is a regular tutor, member of the Trustees and Chair of the Education Planning Board for the British Kodály Academy. In 2017 Lucinda was elected as a Director on the Board of the International Kodály Society. Publications written by Lucinda for NYCoS include – Singing Games and Rhymes for Tiny Tots, Singing Games and Rhymes for Early Years (Books 1 and 2) Singing Games and Rhymes for Middle Years (Books 1 and 2) and with Dr László Nemes Singing Games and Rhymes for ages 9 to 99. With Christopher Bell she wrote the musicianship programme Go for Bronze, Go for Silver and Go for Gold.